How Much Commercial Real Estate Do Americans Own? 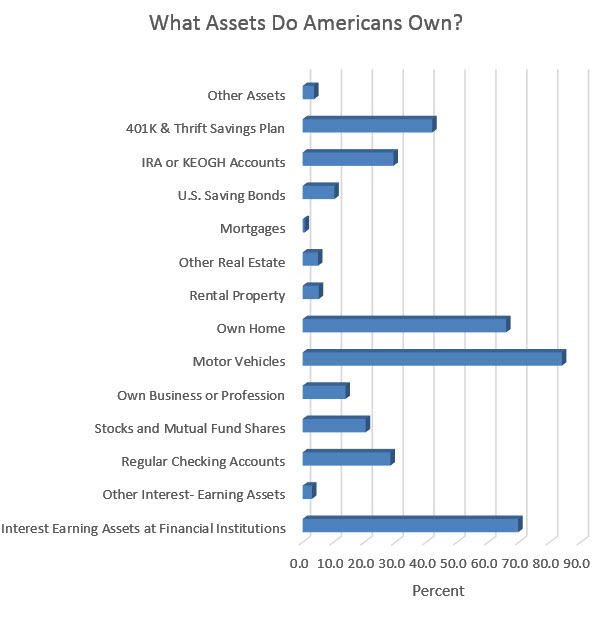 The value of the assets tell a different story, with the median value of assets in 2010 for the average American resulting in a net worth of $66,740, but only $15,000 if you exclude the equity in the home, as shown in the table below. The interesting number is the median value of commercial real estate, that is, rental property is $170,000 and other than home real estate equity is $75,000. So how can the rental property equity be higher than the net worth? Both numbers are after debt is subtracted. The answer is that not everyone owns rental property, but when all the values are calculated the values of rental property are higher than other categories. There is more than 5 times the equity in commercial real estate than in the average household’s IRA or 401(k). Americans may have been created equal, but a vast difference exists between the races, as shown in the table below. Hispanics have less than 10% of the average net worth and blacks have 5% of the average net worth, compared to Americans as a whole. The economically disadvantages the two fastest growing populations, who have realized they control their destiny by voting the Democratic Party into office since the Republican Party has ignored their needs. Another conclusion from the 2010 census was the median net worth of households according to education, with the median high school drop out having a net worth of 5% of the household with a bachelor’s degree. This is why we will continue to experience crime in New Orleans until we find a way to get more students through high school and into trade schools. The assets New Orleans commits to higher graduation rates will easily pay for itself.